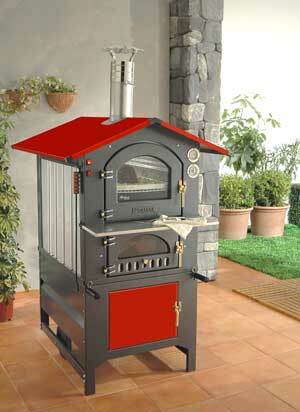 The Rosso is the colored version of the GUSTO, Fontana's best selling unit, the original portable wood-fired oven. Many can be found in Italy to still be in use after 30 years of service. The Rosso is a heavy duty unit that is made of a combination of cast iron, steel, and stainless steel for years of dependable use. They are extremely practical and easy to use - equipped with an interior light and a convection fan. ROSSO 80RV - Depth 32", Width 16", Height 16"
ROSSO 80RV - Depth 48", Width 40", Height 63"